An African hunter who claims to have killed more than 5,000 elephants says he is ‘totally unrepentant’ about the deaths he has caused. Ron Thomson, 77, who worked in Africa’s national parks for almost six decades, claims he was not hunting the animals for pure sport but was managing population that would otherwise have got out of control. However, animal rights campaigners point out that elephant numbers are in steep decline and say ‘management culling’ is often used as a cover for trophy hunting. Mr Thomson was forced to defend his record after a report by the Campaign to Ban Trophy Hunting branded him one of the world’s most prolific elephant killers. © Provided by Associated Newspapers Limited Campaigners rubbished Mr Thomson’s claims, saying elephant numbers are in steep decline and ‘management culls’ are often used as fronts for trophy huntsThat total does not include kills he made while leading a culling team that shot 2,500 elephants and 300 hippos in Gonarezhou National Park in the 1970s. Speaking to The Independent, he said: ‘I’m totally unrepentant, a hundred – ten thousand – times over for any of the hunting I’ve done because that’s not the problem. © Provided by Associated Newspapers Limited Ron Thomson, 77, says he is ‘totally unrepentant’ after killing more than 5,000 elephants during a nearly six decade career working in Africa’s national parksHe argues that elephants are not an endangered species, that wildlife parks in southern Africa have ‘ten to 20 times more elephants’ than they can sustain, and that this is destroying the environment. Eduardo Gonçalves, founder of the Campaign to End Trophy Hunting, rubbished Mr Thomson’s claims – saying natural animal populations rarely ‘overstock’ themselves. Mr Gonçalves’ report claims that, since the 1980s, elephant numbers in southern Africa have declined from 1.3million to just over 400,000. Stephen Paddock did not have a criminal record. He is said to have worked as an accountant and had a pilot’s and hunting license. Most people in Wisconsin may be shocked to learn children at the absurdly young age of 10 without any training at all in gun safety are being encouraged to roam our woods during hunting season using fully loaded firearms. 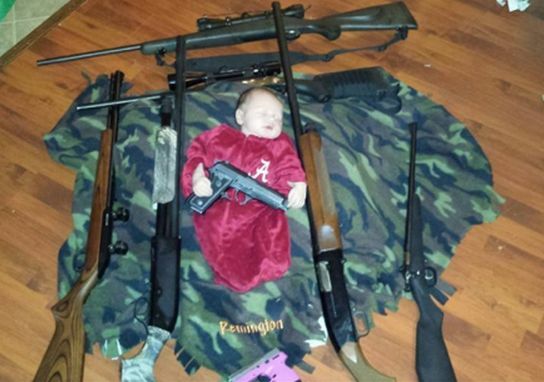 A bizarre gun subculture in this state actually won the support of Republicans controlling the Legislature for that irrational change in state hunting laws to intentionally increase the number of deadly weapons in the hands of very young children. OK, brace yourselves. Republicans now want to make that dangerous situation unbelievably worse. Republican state Rep. Joel Kleefisch of Oconomowoc, married to Wisconsin’s lieutenant governor, has proposed a bill opening the way for toddler hunting. He wants to totally eliminate the state’s minimum age for children hunting with firearms without passing a gun safety course. This has absolutely nothing to do with Wisconsin’s celebrated, strong hunting tradition. In fact, the radical changes in hunting laws are prompted by exactly the opposite—a fear by the extreme gun subculture that support for hunting in this state is growing weaker all the time. Hunting enthusiasts have worried for years about the future of their blood sport because aging participants are dying off without being replaced by younger people. Kids today! You can’t get them to stop playing video games long enough to go out and really kill something. That’s why the Legislature lowered the age to 10 for a so-called mentored hunt, allowing gun-toting parents to take very young children into the woods to get them hooked on blowing away animals before the kids become teenagers and discover less violent forms of amusement with each other. An adult is supposed to stay within an arm’s length of an untrained child with a gun and the two of them must share a gun. Another dangerous change Kleefisch proposes is permitting both the adult and untrained child to be armed. 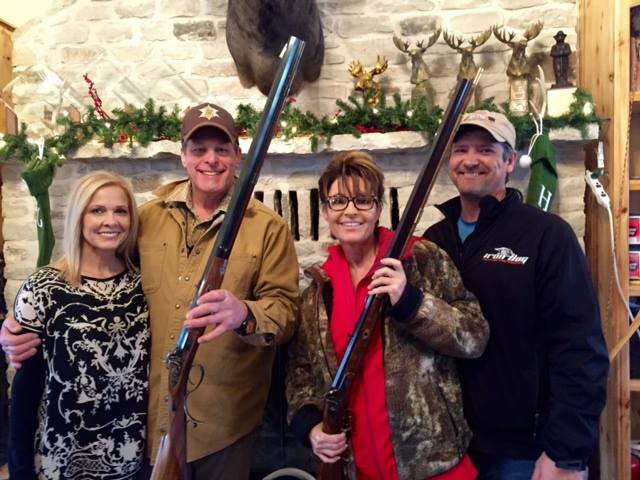 If a deer suddenly appears, it’s not difficult to imagine both of them firing excitedly and lethally every which way. There were more than 30,000 mentored hunts with young children in 2014, but apparently those kids weren’t nearly enthusiastic enough about killing stuff. So the only thing left for Republicans to do is to start arming kindergarteners and preschoolers. What could be a more wholesome form of family entertainment? Well, let’s think. Almost anything. One of the most beautiful qualities of sweet, little children is their love of animals. Not their love of shooting animals. Their love for animals. Why not go to the Wisconsin Humane Society and adopt a pet for your children to love and care for? Take them to the zoo to see awesome animals from around the world and develop a healthy interest in protecting the planet and all its living species. There’s a reason why young children love their stuffed animals. And it’s not because they’re eagerly looking forward to an adulthood where their trophy rooms will be lined with stuffed animal heads staring at them with glass eyes. Children are supposed to love Elmo, not think about tracking him, assassinating him and nailing his bright red hide to their bedroom walls. In fact, psychologists warn that any child who shows cruelty by torturing or killing animals at a young age actually may be exhibiting warning signs of mental illness or psychotic behavior in adulthood. Jeffrey Dahmer did just that, you may recall. And it’s not just wimpy liberals appalled by guns and hunting who think early childhood hunting is a terrible idea. Experienced hunters are the strongest supporters of improving hunter safety education. Ray Anderson, a Madison hunting safety instructor, submitted written testimony to the Legislature warning many children under 12 are simply physically incapable of controlling powerful firearms and far too immature to use sound judgment regarding gun safety. Joseph Lacenski, president of the Wisconsin Hunter Education Instruction Association, also opposed legalizing hunting with deadly weapons by younger children. It’s no surprise Kleefisch’s bill has the support of the National Rifle Association. The NRA’s twisted new advocacy of a gun in every child’s lunchbox is a gross betrayal of what once was that organization’s primary mission, safety education for hunters and gun owners. When I was a new parent, my child’s tiny fingers seemed like a miracle to me. There’s something obscene about imagining them wrapped around the trigger of a gun. The illegal killing of Cecil, a beloved African lion, put a spotlight on the horrors of trophy hunting. My family recently learned that Jimmy John’s restaurant’s founder and CEO, Jimmy John Liautaud, is a trophy hunter. We were outraged, and decided to stop eating at Jimmy John’s. But my seven-year-old daughter, Grace, wants us to do more. Grace wants to take action and get Jimmy John to end his trophy hunting. Jimmy John’s is getting ready to take its company public — a huge moment for any business. It is being reported that the company will be valued at more than $2 billion. This is a great opportunity to let potential investors know what people think of Jimmy John’s trophy hunting. There may be some money in this investment, but is it worth supporting a man who kills endangered animals for sport? Join Grace in calling on the founder and CEO of Jimmy John’s, Jimmy John Liautaud, to publicly commit to no longer participate in trophy hunting. This controversy surrounding Jimmy John is nothing new. Reports of Jimmy John Liautaud hunting big game came out in 2011. 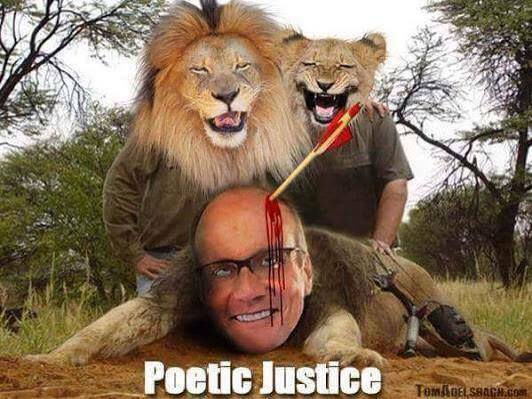 Now, with the issue resurfacing after the senseless killing of Cecil in July, we have an opportunity to put pressure on Mr. Liautaud. 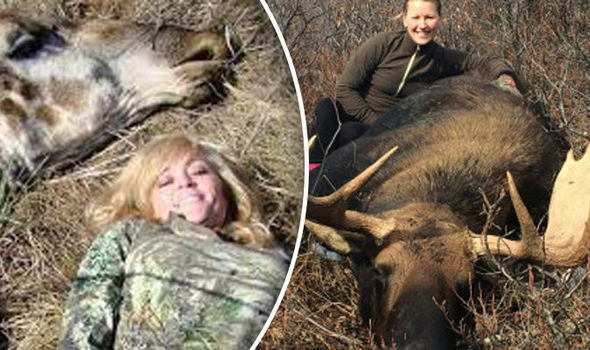 Trophy hunting is defined as “a specific and selective legal form of wildlife use that involves payment for a hunting experience and the acquisition of a trophy by the hunter”. In simpler terms, big game hunting consists of wealthy people paying big bucks to slaughter animals for “fun”. Join me in showing my daughter that her voice can be heard. Please sign this petition and help put an end to Jimmy John Liautaud’s trophy hunting. Why Do Trophy Hunters Resent Cecil the Lion’s Name? Because, as with other serial killers, Trophy Hunters want their victims to remain anonymous. They make every effort to depersonalize their living targets, so the last thing they want is someone giving them a human name and an identity. Look rule of thumb.If your a hunter you don’t harvest an animal your kids have tagged with a silly human name with human attributes attached.So silly tourists who drive around in raised vehicle leaving them safe from good old Cecils claws and teeth got undercut by another silly American paying a huge fee to use his permit on a lion . Poll: Do you think big game hunting should be allowed under certain circumstances? Vote NO here: Big game hunting: Conservation or cruelty? 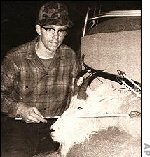 Alaska serial killer/big game hunter Robert Hansen, with his trophy kill. Some people are animal people and some are people people, while others claim to love everyone equally. The fact is, whether consciously or not, at some point we all have to make a choice as to where our sympathies really lie. It seems that all but the most saintly of us has a limited quantity of compassion. If it’s too focused, a lot of individuals can get left out, but spread too thin it’s not much good to anyone. 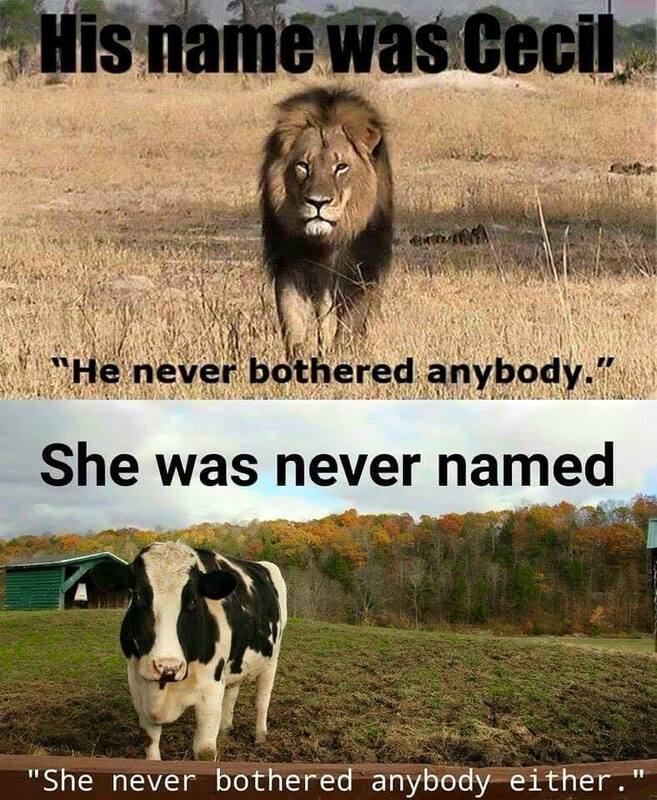 Animal advocates are often some of the most caring people around, yet at times it appears as if they don’t have a whole lot of compassion for the people who abuse animals. Most animal rights supporters actually have a limited empathy allotment, so they tend to save theirs for the victims—not the perpetrators—of cruelty. When animal rights advocates look at their own culpabilities, they take responsibility and work to change their actions. This is something you cannot expect from willful animal exploiters. Those who knowingly mistreat can’t be made to feel shame for anything; they’ve built up a wall of rationalization eight feet thick. Nothing gets in. They can’t or won’t be changed, though they may profess a profound transformation to their parole board. Such was surely the case with Ted Bundy, before he ultimately confessed to the brutal murders of thirty young women (many of whom he decapitated and—like a typical sport hunter—kept their heads as trophies to help him relive the kills). When the day of Ted Bundy’s execution finally came, people in Florida were weighing in on all sides of the issue. 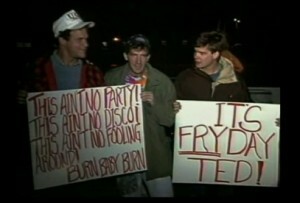 On one extreme were folks chanting and carrying signs like, “Thank God it’s FRY-day,” “Bye-Bye Bundy, and more power to you” and “Hey Ted, don’t forget to file an appeal in Hell” expressing their displeasure with the serial killer’s horrendous acts. At the other end of the spectrum was a virtual fan club of Ted Bundy devotees and groupies, one of whom had married him surreptitiously during his sentencing hearing. Most people’s reactions were somewhere in between the two, depending on where their sympathies lie. As always, mine are with the victims.